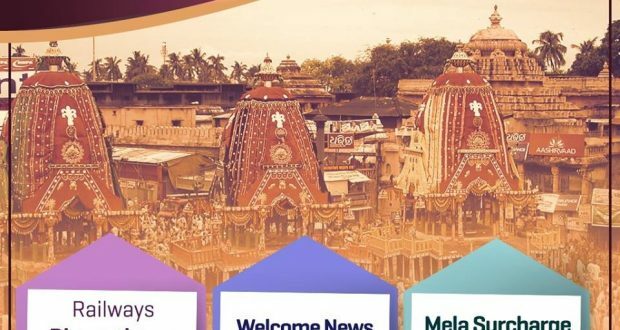 Bhubaneswar:19/12/18: Good news for railway passengers travelling to Puri during Rath Jatra. The Indian Railways has discontinued the Mela Surcharge, which was imposed on passengers during major fairs and festivals across the country, with effective from December 11. The railways took this decision ahead of the Kumbh Mela to be held in Allahbad next month. Sources said the East Coast Railways (ECoR) imposes this extra charge on passengers during Rath Jatra every year. It had collected Rs 30 lakh as surcharge, levied on tickets costing more than Rs 15, during the annual festival in Puri this year. The ECoR had charged Rs 5 and Rs 20 for second class and sleeper tickets booked in ordinary and mail express trains, respectively. Similarly, passengers who booked AC Chair Car and AC-3 tier tickets were charged Rs 40 while Rs 60 and Rs 80 were collected for AC-2 and AC first class tickets, respectively.